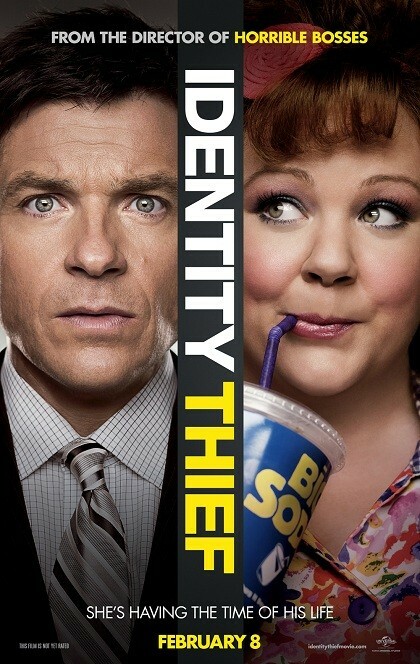 Identity Thief stars Jason Bateman & Melissa McCarthy as Sandy Peterson (the Victim) and Diana (the thief). Sandy, is the average guy with wife, kids, & a modest salary with enough money to get by. Diana steals his identity, starts running up charges on credit cards and also getting into trouble with the law. Sandy realizes that something is wrong when he can’t use his credit card to buy some gas that something is wrong. Unfortunately he gets pulled over for a minor traffic violation, and ends up being brought in because he’s got warrants in Florida. When the cops pull up a mugshot from Florida, they realize that Sandy’s identity has been stolen. Unfortunately, the cops won’t do anything, because it’s out of their jurisdiction. So, Sandy decides to fly down to Florida and bring the thief back with him to Colorado. This will clear his name. Because, not only is this affecting his credit score and his criminal record, but he may cost him his new job. He finds Diana, but unfortunately, some drug cartel baddies & a bounty hunter are after her. So, they end up on a road trip from Florida to Colorado. Unfortunately for Sandy, Diana isn’t to happy to go with him. Plus they have tons of obstacles along the way.